Sheldon Gary Adelson (pronounced /ˈædəlsən/; born August 4, 1933) is an American business magnate, investor, and philanthropist. He is the founder, chairman and chief executive officer of Las Vegas Sands Corporation, which owns the Marina Bay Sands in Singapore, and is the parent company of Venetian Macao Limited, which operates The Venetian Resort Hotel Casino and the Sands Expo and Convention Center. He owns the Israeli daily newspaper Israel Hayom and the American daily newspaper Las Vegas Review-Journal. Adelson, a philanthropist and donor to a variety of causes, created the Adelson Foundation in 2007 at the behest of his wife, Miriam. He is a member of the Republican Party, and made the largest single donation to any U.S. presidential inauguration when he gave the Trump inaugural committee US$5 million. As of October 2018[update], Adelson was listed by Forbes as having a fortune of US$33.3 billion, making him the 15th-richest person in the world. He is a major contributor to Republican Party candidates. He was the largest donor, of any party, in both the 2012 and 2016 presidential campaigns. He sat out the Republican primary season during the 2016 presidential campaign but on September 23, he announced a $25 million donation to Donald Trump's 2016 presidential campaign, making him the largest donor to the Trump campaign and the largest donor in the presidential election (although this was less than the $100 million donation some had predicted). Sheldon Gary Adelson was born in 1933, into a low-income family and grew up in the Dorchester neighborhood of Boston, the son of Sarah (née Tonkin) and Arthur Adelson. His father's family was of Ukrainian Jewish and Lithuanian Jewish ancestry. His mother immigrated from England, and one of Sheldon Adelson's grandfathers was a Welsh coal miner. His father drove a taxi, and his mother ran a knitting shop. An entrepreneur is born with the mentality to take risks, though there are several important characteristics: courage, faith in yourself, and above all, even when you fail, to learn from failure and get up and try again. He started his business career at the age of 12, when he borrowed $200 from his uncle (or $2,740 in 2017 dollars) and purchased a license to sell newspapers in Boston. At age 16 in 1948, he then borrowed $10,000 (or $102,349 in 2017 dollars) from his uncle to start a candy-vending-machine business. He attended the City College of New York, but did not graduate. He attended trade school in a failed attempt to become a court reporter, then subsequently joined the army. After being discharged from the army he established a business selling toiletry kits, then started another business named De-Ice-It which sold a chemical spray to help clear frozen windshields. In the 1960s, he started a charter tours business. He soon became a millionaire, although by his 30s he had built and lost his fortune twice. Over the course of his business career, Adelson has created almost 50 of his own businesses, making him a serial entrepreneur. In the late 1970s, Adelson and his partners developed the COMDEX trade shows for the computer industry, beginning in 1979. It was the premier computer trade show through much of the 1980s and 1990s. Entrepreneurship is essentially identifying the path that everyone takes; and choosing a different, better way. 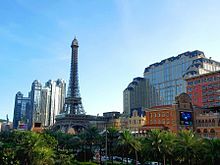 Adelson spearheaded a major project to bring the Sands name to Macau, the Chinese gambling city that had been a Portuguese colony until December 1999. The one-million-square-foot Sands Macao became the People's Republic of China's first Las Vegas-style casino when it opened in May 2004. He recovered his initial $265-million investment in one year and, because he owns 69% of the stock, he increased his wealth when he took the stock public in December 2004. Since the opening of the Sands Macao, Adelson's personal wealth has multiplied more than fourteen times. Adelson's company was reportedly under federal investigation over alleged violations of the Foreign Corrupt Practices Act relating to payments made to a Macau lawyer. In 2015, Sands agreed to pay a $9 million settlement with the Securities and Exchange Commission, which included no admission of wrongdoing. In May 2006, Adelson's Las Vegas Sands was awarded a hotly contested license to construct a casino resort in Singapore's Marina Bay. The new casino, Marina Bay Sands, opened in 2010 at a rumored cost of $5.5 billion. It includes stores at The Shoppes, convention center for Sands Live concert series, multiple swimming pools, night clubs, and 2,500 luxury hotel rooms. In 2007, Adelson made an unsuccessful bid to purchase the Israeli newspaper Maariv. When this failed, he proceeded with parallel plans to publish a free daily newspaper to compete with Israeli, a newspaper he had co-founded in 2006 but had left. The first edition of the new newspaper, Israel Hayom, was published on July 30, 2007. On March 31, 2014, Adelson received the go-ahead from a Jerusalem court to purchase Maariv and the conservative newspaper Makor Rishon. In 2016 Adelson's attorney announced that he does not own Israel Hayom, but that it is owned by a relative of his. According to a Target Group Index (TGI) survey published in July 2011, Israel Hayom, which unlike all other Israeli newspapers is distributed for free, became the number-one daily newspaper (on weekdays) four years after its inception. This survey found that Israel Hayom had a 39.3% weekday readership exposure, Yedioth Ahronoth 37%, Maariv 12.1%, and Haaretz 5.8%. The Yedioth Ahronoth weekend edition was still leading with a 44.3% readership exposure, compared to 31% for the Israel Hayom weekend edition, 14.9% for Maariv, and 6.8% for Haaretz. This trend was already observed by a TGI survey in July 2010. In 2011, the Israeli press said that Adelson was unhappy with coverage of him on Israeli Channel 10, which alleged that Adelson had acquired a casino license in Las Vegas inappropriately through political connections. The channel apologized after Adelson threatened a lawsuit. This led to the resignations of the news chief, Reudor Benziman; the news editor, Ruti Yuval; and the news anchor, Guy Zohar, who objected to the apology. After two months of deliberations, the Israeli Second Authority for Television and Radio ruled that although there were some flaws in the manner in which the apology had been conducted, the decision to apologize had been correct and appropriate. In December 2015 Adelson purchased the Las Vegas Review-Journal newspaper. The purchase was made through a limited liability company called News + Media Capital Group LLC, and his involvement with the deal was initially kept secret. A week after the purchase was announced, three Review-Journal reporters revealed that the deal had been orchestrated by Adelson's son-in-law Patrick Dumont on Adelson's behalf. Commentators described the $140 million paid for the paper as "lavish" and as a dramatic overpayment, and speculated that the move was a power play to further Adelson's business or political agendas. Within a few weeks the paper's editor stepped down in a "voluntary buyout". In January 2016 a set of editorial principles were drawn up and publicized to ensure the newspaper's independence and to deal with possible conflicts of interest involving Adelson's ownership. In February Craig Moon, a veteran of the Gannett organization, was announced as the new publisher and promptly withdrew those principles from publication. He also began to personally review, edit, and sometimes kill stories about an Adelson-promoted proposal for a new Las Vegas football stadium. In the months since, reporters say that stories about Adelson, and particularly about an ongoing lawsuit involving his business dealings in Macau, have been heavily edited by top management. Many reporters and editors left the newspaper citing "curtailed editorial freedom, murky business dealings and unethical managers." All three reporters who originally broke the story about Adelson's ownership have left. Longtime columnist John L. Smith, who had often written about Adelson and had been unsuccessfully sued for libel by him, resigned after he was told he could no longer write anything about Adelson. Adelson's newspaper, the Las Vegas Review-Journal, was the only major newspaper nationwide to endorse Trump. Adelson was also the largest donor to Trump's inaugural celebrations, with a $5 million donation to the celebrations. In a panel discussion at Yeshiva University on October 22, 2013, Adelson said that the United States must get tougher about Iran's suspected nuclear weapons program. Controversy arose when he said: "You pick up your cell phone and you call somewhere in Nebraska and you say 'OK, let it go' and so there's an atomic weapon goes over, ballistic missiles in the middle of the desert that doesn't hurt a soul, maybe a couple of rattlesnakes and scorpions or whatever". He went on to explain that, after a show of force and a threat to also drop a nuclear bomb on Tehran, the U.S. should then say: if "You [Iran] want to be peaceful, just reverse it all and we will guarantee that you can have a nuclear power plant for electricity purposes, energy purposes." Adelson's spokesman told reporters that Adelson "was obviously not speaking literally" about using an atomic bomb in the desert, and that he was "using hyperbole to make a point that ... actions speak louder than words". During the Suen trial, Bill Weidner, the president of Adelson's Las Vegas Sands company, testified about a telephone conversation between Adelson and his friend then-House Majority Leader Tom DeLay (R-TX) about a bill proposed by Representative Tom Lantos (D) that would have prevented the U.S. Olympic Committee from voting in favor of the Chinese bid to host the 2008 Summer Olympics. A few hours later, DeLay called back and told Adelson he could tell the mayor of Beijing "this bill will never see the light of day". The resolution did not pass. Adelson testified in court that the demise of the resolution "...resulted from the press of other legislation, (not from) a deliberate move by DeLay to help his benefactor." Fighting the "mainstreaming" of cannabis legalization is a personal passion of Adelson, whose son Mitchell died of an overdose of heroin and cocaine. Mitchell was said to have used cocaine and heroin from an early age. At the November 2017 conference of the Israeli-American Council, Adelson declared that the organization should become primarily a political lobbying group on Israel-related issues. In contrast to the American Israel Public Affairs Committee (AIPAC), which supports a two-state solution and continued aid to the Palestinians, Adelson charted a course for IAC to oppose both of these positions. Israeli journalist Chemi Shalev said that IAC had not intended to become a political pressure group and that Adelson had "hijacked" it. Adelson has fought increasingly hard against internet based gambling in recent years. Despite the legalization, and acceptance from many Las Vegas Casino CEOs, Adelson has poured money into candidates who want to overturn recent state legislation that legalizes online gambling. In early 2015 Adelson publicly backed a bill introduced in the U.S. House of Representatives. The legislation, named the Restore America's Wire Act, has been met with mixed reviews by the Republican Party. In 2014, Adelson was named to CNBC's list of 200 people who have transformed business over the last 25 years; those on the list were described as "top leaders, icons and rebels, a definitive list of people who have had the greatest influence, sparked the biggest changes and caused the most disruption in business over the past quarter century." Adelson says that because of his upbringing in an immigrant family in an underprivileged neighborhood of Boston, "it went without saying that we were Democrats". He attributed his family's loyalty to their belief that the Democratic Party of the 1930s and 1940s shared their commitment to charity, self-reliance, and accountability, as well as support for Jewish causes. In a 2012 Wall Street Journal op-ed titled "I Didn't Leave the Democrats. They Left me", Adelson specifies three reasons why he switched political parties to the Republicans. First, he cites foreign policy, pointing to a Gallup poll that suggests Republicans are more supportive of Israel than Democrats. Second, he cites statistics that suggest Republicans are more charitable than Democrats. To support this claim Adelson cites a report from the Chronicle of Philanthropy, which claims, after studying tax data from the IRS, that U.S. states that vote Republican are more generous to charities than those states that vote Democratic. "My father, who kept a charity box for the poor in our house ... would have frowned on this fact about modern Democrats." Third, he cites a nonpartisan study of Illinois's finances by the State Budget Crisis Task Force and political scientist Walter Russell Mead claiming that Democratic Party economic policies don't deliver on their promises of social justice and have wrecked one of the country's potentially most prosperous and dynamic states (Illinois). 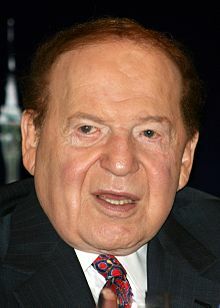 Adelson also states that he doesn't agree with every Republican position and is liberal on several social issues; but believes the Republicans better support liberal democracies like Israel, better exemplify the spirit of charity, and support economic policies that would certainly be better for those Americans now looking for work. Others have attributed different motives for Adelson's party switch. "Why is it fair that I should be paying a higher percentage of taxes than anyone else? ", he reportedly said to an associate according to The New Yorker, which claims Adelson began making major contributions to the Republican National Committee following clashes with labor unions at his Las Vegas properties. Adelson denies those explanations for his political beliefs and behavior, suggesting such depictions of him are tainted by his critics' own political ideology. In February 2012, Adelson told Forbes magazine that he is "against very wealthy people attempting to or influencing elections. But as long as it's doable I'm going to do it. Because I know that guys like Soros have been doing it for years, if not decades. And they stay below the radar by creating a network of corporations to funnel their money. I have my own philosophy and I'm not ashamed of it. I gave the money because there is no other legal way to do it. I don't want to go through ten different corporations to hide my name. I'm proud of what I do and I'm not looking to escape recognition." In May 2004, Adelson opened Sands Macao, Asia's first American style casino. In 2010, Adelson donated $1 million to American Solutions for Winning the Future, a political action committee (PAC) supporting Republican former Speaker of the House Newt Gingrich. In December 2011, during Gingrich's bid for the U.S. presidency, Adelson spoke favorably of controversial remarks Gingrich had made about Palestinians, saying "read the history of those who call themselves Palestinians, and you will hear why Gingrich said recently that the Palestinians are an invented people." Romney believes that China should be pressured to drop its presumptively low fixed exchange rate policy; according to Bloomberg, Adelson would benefit financially in U.S. dollar terms through his interest in Chinese casinos if the Chinese yuan were to appreciate. Early in 2014 Adelson donated $2.5 million to the Drug Free Florida Committee, the political committee trying to defeat Florida's Right to Medical Marijuana Initiative which would legalize Medical cannabis in that state. Later in 2014, Adelson donated an additional $1.5 million to the No On 2 campaign. He believes that cannabis is a gateway drug. According to a 2014 Washington Post report, Adelson's strategy for the 2016 United States presidential election was to support a mainstream candidate capable of winning the presidency. In March 2014 Adelson was set to hold one-on-one chats with possible candidates Jeb Bush, Chris Christie, Scott Walker, and John Kasich during the spring meeting of the Republican Jewish Coalition held at Adelson's hotel and casino The Venetian Las Vegas. During the December 2015 Republican debate held at that same venue, Adelson was reported to have held one-on-one meetings with several of the candidates prior to the start of the debate, including front runner Donald Trump. The bidding to become Adelson's favorite, and ultimately receive tens of millions in financial support, was informally called "The Adelson Primary". On May 13, he endorsed Trump for president, and pledged as much as $100 million to support his campaign. In October 2016 Adelson, whose son died of a drug overdose, donated one million dollars to the campaign against Massachusetts ballot question 4 the Massachusetts Legalization, Regulation and Taxation of Marijuana Initiative which legalized marijuana for personal use. Adelson also donated $1,500,000 towards the unsuccessful effort to thwart the 2016 Florida medical Marijuana Legalization Initiative. Adelson sat out the 2016 Republican primaries, with some early indicators at the beginning of 2016 interpreted as showing that Adelson favored Trump. In May 2016, explaining his reasons for officially endorsing Donald Trump's presidential bid, Adelson cited the importance of CEO experience in a presidential nominee. For the 2018 United States elections, Adelson donated approximately $113 million to the Republican Party through various conservative political action committees. On January 31, ABC News reported that Adelson and his wife Miriam had contributed $500,000 to the Patriot Legal Expense Fund Trust, which was set up in 2018 to assist aides of President Trump under investigation by special counsel Robert Mueller’s probe into Russian interference in the 2016 United States elections. The contributions are the Trust’s largest to date. Adelson donated over $25 million to The Adelson Educational Campus in Las Vegas to build a high school. In 2006, Adelson contributed $25 million to the Yad Vashem Holocaust Martyrs' and Heroes' Remembrance Authority. In a 2016 listing of the top 100 people positively influencing Jewish life, Adelson was described as one of the world's most generous and influential Jewish philanthropists, who 'continues to make outsized gifts to a range of Jewish and non-Jewish groups'. In the 1970s, Sheldon Adelson lived in Massachusetts with his wife, Sandra, and her three children, Mitchell, Gary and Shelley, whom Sheldon adopted when they were young. They divorced in 1988. Adelson met Miriam Farbstein Ochshorn, a medical doctor, on a blind date the following year and married in 1991. She was previously married to a Tel Aviv physician, Dr. Ariel Ochshorn, with whom she had two daughters. Miriam "Miri" Farbstein was born in Mandatory Palestine in 1946, to parents that fled Poland before the Holocaust and settled in the city of Haifa. After earning a Bachelor of Science in Microbiology and Genetics from the Hebrew University of Jerusalem and a medical degree from Tel Aviv University's Sackler Medical School, she went on to become the chief internist in an emergency room at Tel Aviv's Rokach (Hadassah) Hospital. In 1993, she founded a substance abuse center and research clinic there, and in 2000, the couple opened the Dr. Miriam and Sheldon G. Adelson Research Clinic in Las Vegas. Miriam spoke about her lifelong work in a 2012 interview with Fortune Magazine, saying that "saving a drug addict is the equivalent of saving about 20 people. Treating one drug addict reduces his criminal activity, reduces his arrests, reduces his appearances in court, reduces his time sitting in prison, reduces his injecting drugs, reduces him being infected with HIV & Hepatitis C while sharing needles, and reduces his infecting others if he is already infected. It also improves his general medical condition, improves his behavior at home and in the environment, improves his work habits, and has a positive impact on his family by having a normal person around them. By treating one person, we can save many lives, and a mission like that is very much fulfilling." A June 2008 profile in The New Yorker detailed several controversies involving Adelson. In 2008 Richard Suen, a Hong Kong businessman who had helped Adelson make connections with top Chinese officials in order to obtain the Macau license, took Adelson to court in Las Vegas alleging he had reneged on his agreement to allow Suen to profit from the venture. Suen won a $43.8 million judgement; in November 2010, the Nevada Supreme Court overturned the judgment and returned the case to the lower court for further consideration. In the 2013 retrial, the jury awarded Suen a verdict for $70 million. The judge added another $31.6 million in interest, bringing the total judgment against Adelson to $101.6 million. Adelson is appealing again. Adelson faces another trial over claims by three alleged "middlemen" in the deal who are suing for at least $450 million. In August 2012, the Democratic Congressional Campaign Committee (DCCC), after being threatened with a libel suit, apologized and withdrew two blog posts that claimed Adelson had donated "Chinese prostitution money" to Republicans. Another organization, the National Jewish Democratic Council, posted on their website that Adelson "personally approved" of prostitution at his Macau resorts. Adelson sued for libel, but a federal judge dismissed the suit in September 2013, ordering Adelson to pay the NJDC's legal fees. In 2008, the share prices of the Las Vegas Sands Corp. plunged. In November 2008, Las Vegas Sands Corp. announced it might default on bonds that it had outstanding, signaling the potential bankruptcy of the concern. Adelson lost $4 billion in 2008, more than any other American billionaire. In 2009, his net worth had declined from approximately $30 billion to $2 billion, a drop of 93%. He told ABC News "So I lost $25 billion. I started out with zero...(there is) no such thing as fear, not to an entrepreneur. Concern, yes. Fear, no." In the Forbes 2009 world billionaires list, Adelson's ranking dropped to #178 with a net worth of $3.4 billion, but by 2011, after his business had recovered, he was ranked as the world's 16th-richest man with a net worth of $23.3 billion. Adelson owns a fleet of private jets through Las Vegas Sands. On January 2, 2017, Adelson's Airbus A340-500 jet set a record for the Ben Gurion International Airport by making the longest flight ever leaving the airport by flying nonstop to Honolulu, Hawaii by way of the Arctic Ocean. In 2001, Adelson was diagnosed with peripheral neuropathy, which restricts his ability to stand and walk. On February 28, 2019, Las Vegas Sands announced that Adelson was receiving treatment for non-Hodgkin’s lymphoma. The news was disclosed after a Sands attorney claimed Adelson was too weak to sit for a deposition in a court case involving Richard Suen. Sands spokesman Ron Reese said the side effects of Adelson’s medical treatment had "restricted his availability to travel or keep regular office hours” but had not “prevented him from fulfilling his duties as chairman and CEO” of Las Vegas Sands. ^ a b "Sheldon Adelson". Forbes. February 11, 2018. ^ Primack, Dan (December 16, 2015). "Yes, Sheldon Adelson Bought The Las Vegas Review-Journal". Fortune. Archived from the original on December 16, 2015. Retrieved December 16, 2015. ^ Yilek, Caitlin. "GOP mega-donor Sheldon Adelson 'furious' over Rex Tillerson comments: Report". The Washington Examiner. Archived from the original on May 23, 2017. Retrieved October 31, 2017. ^ Profile Archived January 21, 2013, at the Wayback Machine, NewYorker.com, June 30, 2008. ^ Profile Archived May 1, 2014, at the Wayback Machine, Politico; accessed September 16, 2015. ^ a b c "Sheldon Adelson to give $25m boost to Trump Super Pac" Archived September 24, 2016, at the Wayback Machine Peter Stone. September 23, 2016, The Guardian. ^ "Sheldon Adelson Focuses on Congressional Races, Despite Donald Trump's Pleas" By NICHOLAS CONFESSORE and MAGGIE HABERMANSEPT. 20, 2016. ^ a b c d Rivlin, Gary "When 3rd Place on the Rich List Just Isn't Enough". Archived 2017-10-03 at the Wayback Machine The New York Times, January 17, 2008. ^ "Obituaries". Las Vegas Review-Journal. January 14, 2007. Retrieved August 19, 2012. ^ Robert Levering; Michael Katz; Milton Moskowitz (1985). The Computer Entrepreneurs. Penguin. ISBN 9780452257504. Retrieved August 19, 2012. ^ Sheldon Adelson: I endorse Donald Trump for president. Archived 2016-05-14 at the Wayback Machine The Washington Post. May 13, 2016. ^ a b Lidar Grave-Lazi, IDC Herzliya inaugurates Adelson School of Entrepreneurship. Archived December 29, 2013, at the Wayback Machine jpost.com, December 23, 2013; accessed September 16, 2015. ^ Smith, John L. (May 6, 2014). "Risk is crucial in business; so is having an Uncle Al". Las Vegas Review-Journal. Archived from the original on December 22, 2015. ^ "US Inflation Calculator". Archived from the original on October 28, 2013. ^ "Sheldon Adelson". Forbes. Retrieved August 27, 2018. ^ Connie Bruck (June 30, 2008). "The Brass Ring". The New Yorker. Archived from the original on January 21, 2013. Retrieved February 7, 2013. ^ Connie Bruck (June 30, 2008). "The World of Business: The Brass Ring". The New Yorker. Archived from the original on January 21, 2013. Retrieved February 7, 2013. ^ Sheldon Adelson profile Archived February 3, 2014, at the Wayback Machine CNN.com, October 26, 2007. ^ Petty, Precious (June 10, 2009). "Sands Casino Resort Bethlehem Opens With Pledge from Sheldon Adelson, Protest from Church Group" Archived September 24, 2012, at the Wayback Machine, The Express-Times; retrieved August 18, 2012. ^ Assad, Matt. "Sands CEO Sheldon Adelson Admits If He Had to Decide Today He Wouldn't Build a Casino in Bethlehem, Pennsylvania" Archived November 3, 2012, at the Wayback Machine, hotels-online.com, April 8, 2010; retrieved August 18, 2012. ^ a b c d e Bruck, Connie, "The Brass Ring – A Multibillionaire's Relentless Quest for Global Influence" Archived January 21, 2013, at the Wayback Machine, The New Yorker, June 30, 2008; retrieved August 17, 2012. ^ "Move over, Vegas: World's biggest casino opens in China". The Seattle Times. August 28, 2007. Archived from the original on September 20, 2017. Retrieved September 20, 2017. ^ Ross, Brian; Mosk, Matthew; Galli, Cindy; Schwartz, Rhonda (January 27, 2012). "Bribes, Chinese Mob Ties Alleged at Casino of Gingrich Money Man". ABC News. Archived from the original on January 28, 2012. Retrieved January 29, 2012. ^ Choma, Russ. "Sheldon Adelson's Casino Agrees to Pay $9 Million in Foreign Corruption Case". Mother Jones. Archived from the original on November 4, 2016. Retrieved November 3, 2016. ^ Staff Reporter. "Singapore's 50 largest hotels 2015". Singapore Business Review. Singapore Business Review. Archived from the original on September 6, 2015. Retrieved December 4, 2015. ^ Vare, Rosie. "Top 10 gambling cities around the world". money.aol.co.uk. AOL Money. Archived from the original on November 16, 2015. Retrieved December 4, 2015. ^ Staff (July 12, 2007). "American Billionaire Launching Free Israeli Daily". Arutz Sheva. Archived from the original on December 3, 2008. ^ Sheldon Adelson approved to buy Israeli newspaper Archived April 2, 2014, at the Wayback Machine, jta.org, March 31, 2014; accessed September 16, 2015. ^ "Adelson's attorney says billionaire doesn't own Israel Hayom". The Times of Israel. Archived from the original on February 13, 2016. ^ "Israel Comes to You" Archived August 30, 2012, at the Wayback Machine, Israel Hayom; retrieved August 23, 2012. ^ Friedman, Ron (July 29, 2010). "Israel Hayom beats Yediot in readers". Jpost. Archived from the original on February 1, 2014. Retrieved January 25, 2014. ^ a b Cashman, Greer Fay (November 7, 2011). "Second Authority backs Channel 10's Apology to Adelson". The Jerusalem Post. Archived from the original on August 16, 2012. Retrieved August 24, 2012. ^ Staff (September 8, 2011). "Israeli News Chief Quits Over Apology to Mogul". Vos Iz Neias?. Archived from the original on April 2, 2012. Retrieved August 24, 2012. ^ Primack, Dan (December 15, 2015). "Why The Las Vegas Review-Journal's New Owner Remains a Mystery". Fortune. Archived from the original on October 12, 2017. Retrieved October 11, 2017. ^ DeHaven, James; Stutz, Howard; Robison, Jennifer (December 17, 2017). "Adelson son-in-law orchestrated family's purchase of Las Vegas Review-Journal". Las Vegas Review-Journal. Archived from the original on October 12, 2017. Retrieved October 11, 2017. ^ "Sheldon Adelson's Purchase of Las Vegas Paper Seen as a Power Play". The New York Times. January 2, 2017. Archived from the original on October 12, 2017. Retrieved October 12, 2017. ^ Domonoske, Camila (December 23, 2015). "Newspaper Editor Steps Down After Publication's Billionaire Buyer Unmasked". NPR. Archived from the original on October 12, 2017. Retrieved October 11, 2017. ^ Doctor, Ken (February 4, 2016). "Sheldon Adelson tightens grip on Review-Journal". Politico. Archived from the original on August 28, 2017. Retrieved October 11, 2017. ^ Ember, Sydney (May 22, 2016). "In Sheldon Adelson's Newsroom, Looser Purse Strings and a Tighter Leash". The New York Times. Archived from the original on September 14, 2016. Retrieved October 11, 2017. ^ a b Wagner, Laura (May 9, 2016). "More Journalists Leaving 'Las Vegas Review-Journal' After Sale To Billionaire". NPR. Retrieved October 11, 2017. ^ "EDITORIAL: Donald Trump for president". Las Vegas Review-Journal (online ed.). October 22, 2016. Archived from the original on October 24, 2016. Retrieved October 25, 2016. ^ "Trump lands first major newspaper endorsement". MSN. Archived from the original on October 14, 2017. ^ "Adelson: Nuke Iran to Get It to Talk Business (video)". Jewish Press. October 24, 2013. Archived from the original on October 25, 2013. Retrieved October 26, 2013. ^ Shwayder, Maya. "Adelson: US should drop atomic bomb on Iran". The Jerusalem Post. Archived from the original on October 26, 2013. Retrieved October 26, 2013. ^ "'Loose the nukes' talk from Adelson isn't helping". Archived from the original on November 1, 2013. Retrieved October 31, 2013. ^ a b Fineout, Gary (October 23, 2014). "Casino mogul and trial lawyer pay for pot battle". The Washington Times. Archived from the original on November 19, 2014. Retrieved November 10, 2014. ^ Zohar, Amir. "The Adelson method". Haaretz. Archived from the original on September 4, 2014. Retrieved November 10, 2014. ^ a b Joseph, Chris. "Sheldon Adelson Donates Another $1.5 Million to Anti-Medical Marijuana Group". browardpalmbeach.com. Archived from the original on October 6, 2014. Retrieved October 6, 2014. ^ Chemi Shalev (November 7, 2017). "Adelson Has Hijacked the Israeli-American Community for His Hard-right Agenda; New political pressure group will outflank AIPAC and fragment the Jewish establishment". Haaretz. Archived from the original on November 8, 2017. ^ Vardi, Nathan. "Sheldon Adelson Says He Is 'Willing To Spend Whatever It Takes' To Stop Online Gambling". Forbes. Archived from the original on November 8, 2017. ^ Adelson profile Archived April 24, 2015, at the Wayback Machine, HuffPost, March 26, 2015. ^ "Sheldon G. Adelson and Dr. Miriam Adelson Receive Prestigious Woodrow Wilson Award for Corporate Citizenship" (Press release). Las Vegas Sands Corp. (via PR Newswire). March 26, 2008. Archived from the original on October 22, 2014. ^ "Past Anniversary Dinners" Archived May 13, 2008, at the Wayback Machine, Nevada Policy Research Institute; retrieved August 24, 2012. ^ Lake, Eli (May 13, 2008). "Bush Visit May Boost Olmert". The New York Sun. Archived from the original on September 11, 2012. Retrieved August 24, 2012. ^ "CNBC First 25: The Contenders". CNBC. January 17, 2014. Archived from the original on February 3, 2014. Retrieved February 4, 2014. ^ Adelson, Sheldon G. (November 7, 2012). "I didn't leave Democrats, they left me". The Australian. ^ "Poll: 78% of Republicans Support Israel versus 53% of Democrats". The Jewish Press. March 18, 2012. Archived from the original on October 14, 2013. Retrieved October 10, 2013. ^ Kim, Susanna (August 20, 2012). "The Most Generous States: Republican and Religious". ABC News. Archived from the original on September 1, 2013. ^ Adelson, Sheldon G. (November 4, 2012). "Sheldon G. Adelson: I Didn't Leave the Democrats. They Left Me". The Wall Street Journal. Archived from the original on January 27, 2015. Retrieved October 10, 2013. ^ Walter Russell Mead (October 25, 2012). "News From Obama's Home State". The American Interest. Archived from the original on November 5, 2017. Retrieved October 13, 2017. ^ Beam, Alex (May 31, 2008). "Adelson Bets Big on Right-Wing Politics" Archived October 22, 2012, at the Wayback Machine, The Boston Globe; retrieved August 17, 2012. ^ "The Brass Ring". The New Yorker. Archived from the original on January 3, 2016. ^ Sheldon G. Andelson (November 4, 2012). "Sheldon G. Adelson: I Didn't Leave the Democrats. They Left Me". The Wall Street Journal. Archived from the original on January 27, 2015. Retrieved October 10, 2013. ^ Bertoni, Steven (February 21, 2012). "Billionaire Sheldon Adelson Says He Might Give $100M to Newt Gingrich or Other Republican". Forbes. Archived from the original on February 21, 2012. Retrieved August 17, 2012. ^ Cohen, Muhammad. "Sands Macao: The House That Built Sheldon Adelson". Forbes. Retrieved August 14, 2018. ^ Drinkard, Jim (January 17, 2005). "Donors Get Good Seats, Great Access This Week". USA Today. Archived from the original on June 28, 2012. Retrieved August 24, 2012. ^ Staff (January 16, 2005). "Financing the Inauguration". USA Today. Archived from the original on June 28, 2012. Retrieved August 24, 2012. ^ Staff (January 14, 2005). "Some Question Inaugural's Multi-Million Price Tag". USA Today. Associated Press. Archived from the original on June 28, 2012. Retrieved August 24, 2012. ^ (registration required) Luo, Michael (April 12, 2008). "Great Expectations for a Conservative Group Seem All but Dashed". The New York Times. Archived from the original on December 3, 2011. Retrieved April 12, 2008. ^ Staff. "Sheldon G. Adelson Contributions to 527 Organizations, 2010 Cycle". OpenSecrets.org. Archived from the original on October 22, 2012. Retrieved August 24, 2012. ^ Blumenfeld, Revital (December 26, 2011). "Sheldon Adelson to Birthright Group: Gingrich Is Right to Call Palestinians 'Invented People'". Haaretz. Archived from the original on January 27, 2012. Retrieved January 28, 2012. ^ "Sheldon Adelson - $139,200 in Political Contributions for 2010". Campaignmoney.com. Archived from the original on October 6, 2012. Retrieved August 19, 2012. ^ Marc Fisher, "Sheldon Adelson: Casino magnate, mega-donor is a man of many motives" Archived November 23, 2017, at the Wayback Machine, Washington Post, October 23, 2012. ^ a b Matea Gold and Philip Rucker, "Billionaire mogul Sheldon Adelson looks for mainstream Republican who can win in 2016" Archived May 20, 2017, at the Wayback Machine, Washington Post, March 25, 2014. ^ McFadden, Cynthia; Arons, Melinda (January 24, 2012). "Billionaire Expects 'Nothing' for His Millions to Gingrich Super PAC, Source Says". ABC News Nightline. Archived from the original on August 19, 2012. Retrieved August 18, 2012. ^ Mundy, Alicia (February 21, 2012). "Adelson Says He Could Give $100 Million More to Help Gingrich". Washington Wire (blog of The Wall Street Journal). Archived from the original on October 3, 2012. Retrieved August 18, 2012. ^ "New G.O.P. Help From Casino Mogul". The New York Times. June 16, 2012. Archived from the original on March 12, 2017. ^ "About" Archived October 29, 2014, at the Wayback Machine. Congressional Leadership Fund; retrieved August 18, 2012. ^ "House Introduces Online Gambling Bill Backed by Sheldon Adelson". Time. Archived from the original on January 28, 2017. Retrieved March 10, 2017. ^ Gold, Matea (June 13, 2012). "Casino Magnate Sheldon Adelson Gives $10 Million to Pro-Romney PAC – The Casino Magnate's Check to the Pro-Romney Restore Our Future Instantly Skyrockets Him to the Top of That Super PAC's List of Megadonors". The Seattle Times. Archived from the original on July 18, 2012. Retrieved August 18, 2012. ^ Peoples, Steve (July 31, 2012). "Another Hiccup? Romney's Foreign Trip Not Smooth". The Atlanta Journal-Constitution. Associated Press. Archived from the original on August 3, 2012. Retrieved August 18, 2012. ^ a b Lerer, Lisa (July 30, 2012). "Romney Donors on Agenda Along with Policy on Israel Trip". Bloomberg Businessweek. Archived from the original on November 5, 2012. Retrieved October 22, 2012. Among the 50 donors gathered around a U-shaped conference table for the event were meatpacking magnate John Miller, a close friend of Romney's; oil investor L.E. Simmons; New York finance Chairman Woody Johnson, the owner of the New York Jets; hedge fund manager Paul Singer; and Detroit businessman John Rakolta.... When Romney arrived, he took a seat at the head of the table, next to the other unofficial guests of honor: Adelson and his wife, Miriam. ^ "Donors Invest Millions in Romney for Billions in Returns". Bloomberg. August 31, 2012. Archived from the original on September 2, 2012. Retrieved September 2, 2012. ^ "Nevada billionaire spending millions against Fla. marijuana amendment". Archived from the original on June 13, 2014. Retrieved June 12, 2014. ^ Klas, Mary Ellen. "Medical marijuana opponents gain money and allies, including billionaire Sheldon Adelson". Tampa Bay Times. Archived from the original on July 7, 2014. Retrieved June 30, 2014. ^ "Just a Reminder That the Real Host of Tonight's GOP Debate Is Sheldon Adelson". Daily Intelligencer. Archived from the original on December 18, 2015. Retrieved December 17, 2015. ^ "Millions at stake, the 'Adelson primary' is neck and neck". Yahoo! News. Retrieved February 18, 2018. ^ "Marco Rubio is trying to win the Sheldon Adelson primary". Tampa Bay, Florida news. December 14, 2015. Retrieved February 18, 2018. ^ a b Adelson, Sheldon G. (May 13, 2016). "Sheldon Adelson: I endorse Donald Trump for president". Washington Post. Archived from the original on May 16, 2016. Retrieved May 22, 2016. ^ "Sheldon Adelson Is Poised to Give Donald Trump a Donation Boost". The New York Times. Archived from the original on February 24, 2017. ^ Florida, The News Service of. "Money Pouring Into Marijuana Committees". Archived from the original on November 11, 2016. Retrieved November 22, 2016. ^ "GOP leader's gambling bill heads to Florida lawmakers". TBO.com. February 27, 2015. Archived from the original on November 11, 2016. Retrieved November 22, 2016. ^ McCormick, John; Allison, Bill (October 20, 2018). "Adelsons Add $25 Million to Their Midterm Campaign Spending". Bloomberg. Retrieved November 11, 2018. ^ Kim, Soo Rin (January 31, 2019). "Casino mogul gave $500K to Trump campaign's legal defense fund". ABC News. Retrieved February 1, 2019. ^ Tugend, Tom (December 14, 2006). "Vegas billionaire Sheldon Adelson expected to set new charity donation record". The Jewish Journal of Greater Los Angeles. Archived from the original on February 13, 2012. Retrieved January 27, 2012. ^ Livingston, Ashley (October 2, 2008). "Jewish school celebrates new home". Las Vegas Sun. Archived from the original on October 6, 2012. Retrieved January 27, 2012. ^ "The 2006 Slate 60: Pledges". Slate. February 15, 2007. Archived from the original on July 12, 2010. Retrieved January 28, 2012. ^ Benari, Elad (January 12, 2011). "Adelson Foundation Gives Taglit An Extra $5 Million Boost". Arutz Sheva. Archived from the original on December 3, 2011. Retrieved December 5, 2011. ^ "Hollywood gala raises a record $33 million for IDF". The Times of Israel. November 8, 2014. Archived from the original on November 14, 2014. Retrieved November 17, 2014. ^ "About AMRF: Philosophy and Vision" Archived September 22, 2013, at the Wayback Machine, Dr. Miriam and Sheldon G. Adelson Medical Research Foundation; retrieved January 28, 2012. ^ "Friends: Gifts" (Winter 2007) Archived May 5, 2011, at the Wayback Machine, uclahealth.org; accessed September 16, 2015. ^ a b Zohar, Amir, "The Adelson method" Archived September 4, 2014, at the Wayback Machine, Haaretz.com, March 13, 2008; accessed September 16, 2015. ^ a b Bruck, Connie (June 23, 2008). "The Brass Ring". The New Yorker. ISSN 0028-792X. Archived from the original on September 14, 2017. Retrieved September 14, 2017. ^ McIntire, Mike; Luo, Michael (January 28, 2012). "The Man Behind Gingrich's Money". The New York Times. Archived from the original on February 19, 2017. ^ "Meet the woman behind Sheldon Adelson". Fortune. February 8, 2012. Retrieved March 25, 2018. ^ Ryan, Cy (November 18, 2010). "Court overturns $43.8 million judgment against Las Vegas Sands". Las Vegas Sun. Archived from the original on August 29, 2011. Retrieved January 27, 2012. ^ Glionna, John M. (May 14, 2013). "Casino owner Sheldon Adelson hit with $70-million verdict". Los Angeles Times. Archived from the original on November 25, 2015. Retrieved September 21, 2015. ^ "Las Vegas Sands' Adelson loses court battle". CBS News. May 14, 2013. Archived from the original on November 25, 2015. Retrieved September 21, 2015. ^ O'Reiley, Tim (May 28, 2013). "Judgment calls for Las Vegas Sands to pay Suen $101.6 million". Las Vegas Review-Journal. Archived from the original on November 25, 2015. Retrieved September 21, 2015. ^ Pettersson, Edvard (May 29, 2013). "Sands Told to Pay $101.6 Million Over Macau Permit". Bloomberg Business. Archived from the original on January 6, 2016. Retrieved September 21, 2015. ^ Pettersson, Edvard (April 29, 2015). "Adelson May Have to Answer Ex-Macau Chief's Casino Firing Claims". Bloomberg Business. Archived from the original on August 13, 2015. Retrieved September 21, 2015. ^ Michael Schwirtz (March 2, 2013). "In Filing, Casino Operator Admits Likely Violation of an Antibribery Law". The New York Times. Archived from the original on February 28, 2017. ^ "Sheldon Adelson Wins Millions in Damages from British Newspaper". Haaretz. Reuters. March 20, 2008. Archived from the original on March 27, 2008. ^ Tetreault, Steve (August 2, 2012). "Democrats Apologize to Adelson". Las Vegas Review-Journal. Archived from the original on August 5, 2012. Retrieved August 24, 2012. ^ Tal Kopan (September 30, 2013). "Court dismisses Sheldon Adelson defamation suit". Politico. Archived from the original on June 10, 2015. Retrieved October 10, 2013. ^ "#6 Sheldon Adelson". The World's Billionaires. Forbes. March 8, 2007. Archived from the original on July 18, 2012. Retrieved July 17, 2012. ^ "#12 Sheldon Adelson". The World's Billionaires. Forbes. March 5, 2008. Archived from the original on July 9, 2012. Retrieved July 17, 2012. ^ Jinks, Beth (November 6, 2008). "Las Vegas Sands Plunges on Default, Bankruptcy Risk". Bloomberg. Archived from the original on July 13, 2013. Retrieved September 16, 2015. ^ "Now Who's the Richest? The Forbes 400 List Is recalculated to Reflect Financial Meltdown". Bloomberg News. October 10, 2008. Archived from the original on September 14, 2015. Retrieved September 16, 2015. ^ Sheldon Adelson Archived February 19, 2011, at the Wayback Machine, daylife.com; accessed September 16, 2015. ^ Frank, Robert (November 12, 2008). "What Is It Like to Lose $100 Million a Day?". The Wall Street Journal. Archived from the original on November 9, 2017. ^ Frank, Robert (November 22, 2010). "Vegas Tycoon: 'So I Lost $25 Billion'". The Wall Street Journal. Archived from the original on November 8, 2017. ^ "The World's Billionaires 2009" Archived July 18, 2017, at the Wayback Machine, forbes.com, March 11, 2009. ^ Sheldon Adelson profile Archived September 18, 2017, at the Wayback Machine, Forbes.com; retrieved January 25, 2012. ^ Algemeiner Staff. "Jewish Mega Philanthropist Sheldon Adelson Tops Forbes' Annual "Biggest Winner" List, Fortune Climbs $15 Billion". The Algemeiner. Archived from the original on December 25, 2013. Retrieved December 24, 2013. ^ Luisa Kroll,"Billionaire Sheldon Adelson Was Year's Biggest Winner, With Fortune Jumping $15 Billion" Archived December 5, 2017, at the Wayback Machine, forbes.com, December 23, 2013. ^ Sheldon Adelson profile Archived September 18, 2017, at the Wayback Machine, forbes.com; retrieved December 29, 2014. ^ News, A. B. C. (November 19, 2010). "Vegas Billionaire, Pummeled by Recession, Claws His Way Back". ABC News. Archived from the original on July 9, 2016. ^ Sun, Leo. "5 Things You Didn't Know About Las Vegas Sands Corp". The Motley Fool. Archived from the original on June 15, 2017. Retrieved June 29, 2017. ^ Cohen, Muhammad. "Las Vegas Sands Head Sheldon Adelson Illness Echoes Macau Bid History". Forbes. Retrieved March 1, 2019. ^ Cano, Regina Garcia (March 1, 2019). "Casino mogul, GOP donor Adelson getting treatment for cancer". AP NEWS. Retrieved March 1, 2019. ^ Palmeri, Christopher. "Sheldon Adelson Undergoing Cancer Treatment". Fortune. Retrieved March 1, 2019. Wikimedia Commons has media related to Sheldon Adelson. "Sheldon Adelson collected news and commentary". The New York Times.